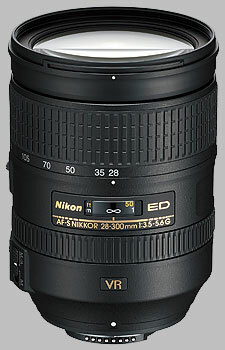 Nikon released the 28-300mm ƒ/3.5-5.6G ED VR AF-S in the fall of 2010, a long-awaited full-frame version of its popular 18-200mm ƒ/3.5-5.6 VR. The 28-300mm takes its design cues from the 18-200mm, while of course being larger and heavier to accommodate the larger glass elements. The lens uses a design of 19 elements in 14 groups, including 3 aspherical and 2 ED elements. On a sub-frame camera, the lens produces an effective field of view of 42-450mm. The lens takes 77mm filters, ships with a petal-shaped lens hood, and is available now for around $1,000. Note: We tested two samples of this lens in order to verify the results we noted while testing the first copy; the second copy provided the same results as the first, so we have decided to proceed with these results. The Nikon 28-300mm ƒ/3.5-5.6G produced some odd results for sharpness, which may or may not be objectionable. As the lens is intended for a full-frame audience, I will begin with our observations with the lens mounted on the D3x. Perhaps the most striking result we obtained was with the lens set to 28mm and ƒ/3.5. We've started coining the term ''sombrero'' to describe this performance - softness in the center, sharpening up out towards the corners, and the some more corner softness. Fortunately, stopping down even to ƒ/4 dramatically reduces this phenomenon, and by ƒ/5.6 we see performance we would expect from a thousand-dollar lens - a sweet spot of sharpness in the center, degrading to slight corner softness. Stopping down at 28mm doesn't produce further sharpness, until ƒ/16 where diffraction limiting removes the central sharpness. This performance is also observed at the 35mm setting. In the mid-range (50-105mm) we don't see the sombrero effect, just some soft corners, when used wide open. In these focal lengths, ƒ/5.6 produces a reasonably sharp center degrading to soft corners, and stopping down to ƒ/8 produces slightly more overall sharpness. At the telephoto end (200-300mm) the lens produces mediocre results when used wide open (ƒ/5.6), but fortunately, stopping down just one stop to ƒ/8 cleans it up - the image is overall just slightly soft, with corners that are just slightly softer. Stopping down further than ƒ/8 doesn't produce any sharper results. Fully stopped-down results are nothing to write home about - while the images produced are consistent from corner to corner, they're soft at the wide end (28mm, ƒ/22) and downright blurry at the telephoto end (300mm, ƒ/36). The above commentary is essentially applicable to the sub-frame images produced on the D300s, with the caveat that soft corners are less of a factor given the reduced field of view available in that camera. So the question is, especially at wide end showing the sombrero pattern, will the average user notice this effect? As a complement to our sample images, we shot a series of photographs of a flat brick wall, with both the Nikon 28-300mm, and a lens we know to be incredibly sharp, the Sigma 70mm ƒ/2.8 Macro. Nikon 28-300mm ƒ/3.5-5.6G AF-S @ 28mm, ƒ/3.5. 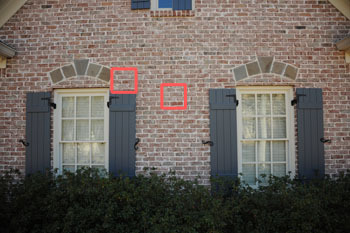 Click on the red squares above to open 100% crops in new windows, or click here to download the original high-resolution file (12.5 MB). Nikon 28-300mm ƒ/3.5-5.6G AF-S @ 28mm, ƒ/5.6. 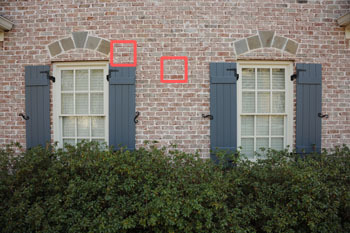 Click on the red squares above to open 100% crops in new windows, or click here to download the original high-resolution file (13.8 MB). Sigma 70mm ƒ/2.8 Macro @ 70mm, ƒ/5.6. Click on the red squares above to open 100% crops in new windows, or click here to download the original high-resolution file (15.4 MB). The long and the short of these images is that if you look at 100% crops, you notice the quality difference, but the effect isn't quite as dramatic as the blur graphs might suggest it would be. The 28-300mm ƒ/3.5-5.6 produces images with noteworthy chromatic aberration, typically showing as blue-magenta fringing on edges of high contrast. The effect is maximized in the corners and is more prominent on the D300s as compared to the D3x; the increased resolution of the D3x (24 megapixels compared to 12) reduces the impact of chromatic aberration. 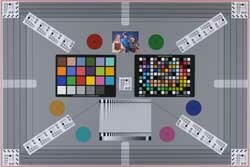 On either camera, there are no settings which completely eliminate the presence of chromatic aberration, but it's less prominent when used in the mid-range of its focal lengths (50-105mm). With the lens mounted on the Nikon D300s, corner shading isn't an issue, thanks to the reduced field of view of the camera. On the D3x however, using the lens at its widest angle and widest aperture (28mm at ƒ/3.5) leads to a full stop of light falloff in the corners; this is easily noticed in the first sample image above. Stopping down and/or zooming in towards the telephoto end reduces the impact of corner shading; when used at wide angle (28-35mm), the effect is never truly minimized. With other focal lengths, stopping down to ƒ/8 or smaller makes the corner shading negligible. The complex array of lens elements that allows such a vast range of focal lengths in one lens leads to some dramatic results for distortion. When mounted on the D300s, the effect isn't as significant, and the lens produces almost no distortion when used at 35mm. Wider than 35mm and you have some notable barrel distortion; above 35mm, you have some pincushion distortion (visible most at 70-105mm). On the full-frame D3x, distortion is much more prominent. Below 35mm, barrel distortion is fairly strong (+1.5% in the corners); again, at 35mm, there is almost no distortion. Zoomed in past 35mm, and pincushion distortion becomes the order of the day, showing most prominently between 50 and 105mm (-1%). As an AF-S lens, autofocus operation is quick and virtually silent, going from close-focus to infinity in less than a second. The 28-300mm will work on all Nikon camera bodies that support SWM (silent wave motor) lenses. 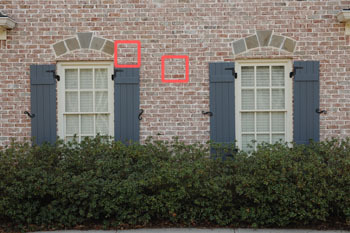 Autofocus results can be overridden at any time by simply turning the focus ring, and attached 77mm filters will not rotate. Macro performance isn't bad, but obviously this isn't a dedicated macro lens: at 300mm, the lens produces 0.32x magnification, and has a minimum close-focusing distance of 50 cm (almost 1 1/2 feet) throughout its zoom range. The Nikon 28-300mm ƒ/3.5-5.6 is a built with a durable plastic construction, finished with a matte black texture. The lens mount is metal and the 77mm filter threads are plastic. The lens comes with a petal-shaped hood. The lens features a switch to disable autofocus (''M/A - M'') and a distance scale marked in feet and meters, located under a clear plastic window. There are no depth of field markings, or an infrared index mark. As a G-series lens, there is no aperture ring. The lens also features nine rounded aperture blades. Two other switches are present, one to enable or disable vibration reduction, and one to select the style of vibration reduction required: active (4-axis) or normal (2-axis, on the horizontal plane). There is a zoom lock switch usable at 28mm, the lens' most compact size. The zoom ring is the larger of the two, mounted towards the end of the lens. The ring is an inch wide, made of a tactile rubber, and surfaced with raised ribs. The zoom ring is nicely cammed: it takes two fingers to move the ring through the ninety degrees of turning radius. At 300mm, there is significant lens extension, as the lens adds three inches to its overall length: from around 4 1/2'' to 7 1/2''. Zoom creep was a widely-reported problem for the 18-200mm lens, so Nikon has included a zoom lock switch, which when selected locks the lens to its 28mm position. The focus ring is plastic, 1/2'' wide and textured with raised ribs. The ring is mounted closer to the lens mount. The ring takes about ninety degrees to run through the focusing range, but there are no hard stops at infinity or close-focus; rather, there is a slight increase of resistance to let you know you're at the end. There is some additional room at infinity to allow for focusing at different temperatures. The front element does not rotate during focus or zoom operations. The petal-shaped HB-50 lens hood reverses onto the end of the lens for storage; the interior of the hood is a smooth, matte finish. The lens is 2 1/2'' long, adding 2 1/4'' to the overall length of the lens when attached. For the DX shooter, the 18-200mm provides a sharper image with less chromatic aberration. Results for corner shading and distortion are relatively similar (when you compare the 28-300 on an FX camera, to the 18-200 on a DX camera). Sigma used to produce one of the original 'superzoom' vacation lenses, but it's been discontinued for some time. Unfortunately we haven't tested it. The Tamron tested as sharper than the Nikon, and provided less chromatic aberration as well; corner shading and distortion results were about the same. A Vibration-Controlled (VC) version of the lens is also available, which we have not yet tested. The Nikon 28-300mm ƒ/3.5-5.6G AF-S VRII provided some questionable results for sharpness - so much so that we tested a second copy. The ''sombrero'' effect at 28mm is somewhat baffling, but it's likely that only discriminating users will notice this particular pattern, and, if you stop down to just ƒ/5.6, you get reasonable performance. However, this is a thousand-dollar lens we're talking about: while making an all-in-one lens is a game of compromises, it feels as if this is a case where Nikon just couldn't find the magic formula. Especially when you consider that for hundreds of dollars less, you can get a Tamron equivalent which offers sharper, and much more consistent, performance. Heavy, mediocre bokeh, zoom creep, distortion, CA, slow lens and slow focus somethimes. If you have FX camera, want perfect IQ travel lens and you can bare the 1100$ hit the road to the first store. 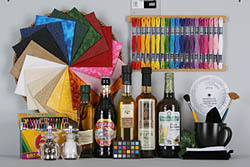 For DX users i would think the other brands also as a alternative, they are cheaper and have also exceptional quality. After buying a D700, I first relied mainly on my old AF lenses from the film days (20-35, 35-70, 80-200) plus some primes, while hoping Nikon would soon come out with serious f4 zooms like Canon users enjoy. I'm just not a fan of the massive and pricey PRO f2.8 zooms, even though they're exceptional glass. So, when the 24-120 f/4 went up for pre-sale, I put my order in, thinking this would be the super IQ, reasonably priced and compact FX lens I had longed for. However, the 24-120 shipments were delayed, while the 28-300 began hitting the streets. After hearing some really positive first impressions from early buyers, I canceled my 24-120 order, and picked up the 28-300 instead. Having had a 18-200mm (and not a particularly sharp copy), my expectations were not too high. Also, I was very concerned by the poor MTF curves for the 28-300. Alas, maybe I just got a great copy, but I'm sure getting very sharp, contrasty images. I can't explain why the MTF curves looked bad, and why some lens tests look poor, but in real world use it does amazingly well. [Just take a look at the test photos that SLRGEAR posts for each tested lens, and compare the 28-300mm to other zooms, even the PRO glass, and see what I mean..] I was so puzzled why even the edges of my images were better than some of my film-era glass that I made direct comparison with my 20-35, 35-70, and 80-200, as well as with my modern 50 1.8 and 60 2.8 micro. While you can see that the center image is subtly better with my primes if you have the two side-by-side, and even then you must look very very closely.. It certainly isn't a dramatic difference. But how nice it is to have such a huge range available without changing lenses all the time. A surprisingly good lens, fits D700 high iso perfect. Very sharp overall, specially stops down to f7,1-f8 . It is superior to the DX 18-200 , much better image quality. Compared to my 80-200 its better from 150 mm. VR works very good. I win at least 3 stops. Hit-rate with this lens is high because I don't have to change any more. Can understand why kenrockwell is so pleased with this lens. - Nikkor 28-200 AF D : not bad at all, it was often on my camera prior to buying the 28-300. - Tamron 28-300 with VC (tested 3 of them) : Oh my god, what a crap ! So I was curious to test this new 28-300. I'm overall very impressed, this lens has a very good usability. This two problems are easily removable during post-processing. - At full aperture, the lens is a little less sharp, but nothing very bad, it's also easily correctible. - The focal lengths range, of course ! - Accurate and silent AF, even at 300 mm when it's dark. - Very efficient (and silent) VR, a real plus at the tele end. - Best image quality of all superzooms I tested so far. Not so good as the 18-200vr was. But a very good swiss knife for allround pictures. Add 09/12/2010: I have change my first sample for a new one. And I can rate for a 9 for the len's image quality. And now this one is more performant than the 18-200vr.